Pam’s Pictorama Photo Post: I spotted the photo of the cat reading first on eBay. Oh man, what I wouldn’t give for those Felix pajama costume she is wearing! Lucky for me the seller wasn’t capitalizing on the Felix-ness of the photo. It was not cheap, but I bought it uncontested. The back reads, ‘Pagliaccio’ is said to be the best trained cat in the business. Zita Harrison has taught him how to spell and how to play the banjo while playing a mouth organ. CREDIT LINES MUST READ: BY ACME. It is not often that Mr. Internet lets me down entirely. 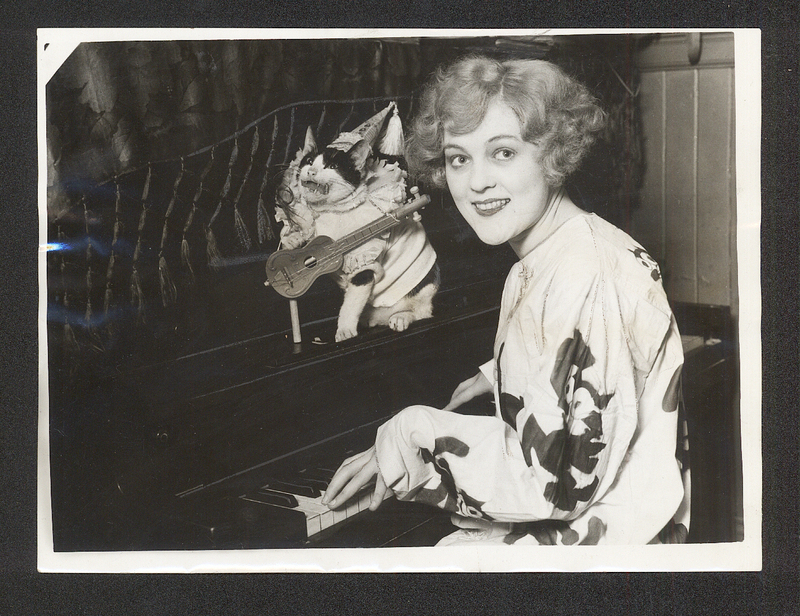 In fact I have become spoiled (and fascinated) by the ability to type in obscure and presumably long lost addresses and information about long forgotten stars of vaudeville (see for example Mad Jenny, an earlier post) into an internet search and generally turning up some information. It was with this in mind that I anxiously typed in Zita Harrison 1926, really wanting to know more about her cat act, and promptly turned up…nothing. A few other variations and searches several pages in and I found the second photo published here in The Plattsburgh Sentinel, but the only additional bit of information is that she is from San Francisco. While waiting for the photo to show up in the mail I tried rolling the internet dice again and this time I notice not only was the other version of the photo online, but it was for sale on Canadian eBay. Needless to say, I purchased that one immediately, and I like it even more – although the Felix suit is not shown off to quite such an advantage. On the back this one is inscribed, lars – S.F. to Cleveland and Acme Feb. 11. ‘Pagliaccio’ is said to be the best trained cat in the business. Zita Harrison has taught him how to spell and how to play the banjo while playing a mouth organ. -vl- It is also stamped Feb. 18 1926. (It is a strange bonus that February 11 is my birthday, Kim purchased it for me, and arrived just in time for the day!) Unlike the first photo where Pagliaccio looks utterly content in his sweater and glasses, he looks decided less happy playing the tiny guitar. Fangy fellow. Given the fact that Zita looks a tad long in the tooth, I tried some earlier periods – her name isn’t terribly common after all. Not even any listings in old newspapers that might have listed the act with others playing in San Francisco. So, I have to wonder. How did she achieve this one publicity push in winter of 1926? It doesn’t seem to correspond with any real articles on her or listings for her performances. I guess we will never know about that or where those great Felix pajamas came from.